Starting a Business Workshop Series (Part 3/3) – Learn how to do more business in 2019. This course will take you through strategies and tactics that will help you market and sell the products or services your business offers. Setting up your business for marketing. Setting up your business for sales. 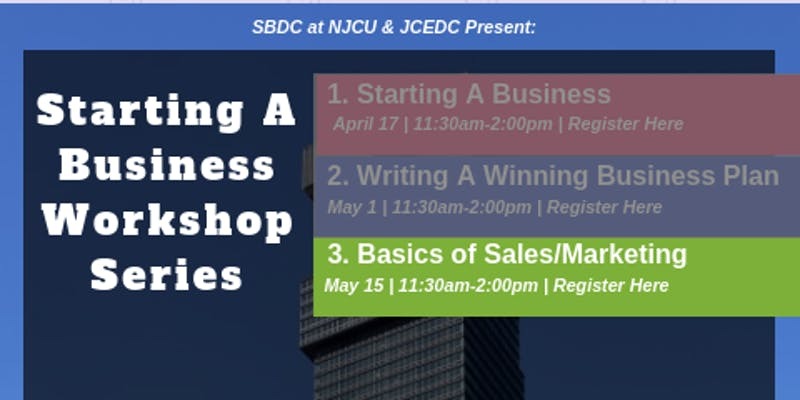 Sponsored and paid for by: the United States Small Business Administration, Small Business Development Center at NJCU, New Jersey City University, and JCEDC. Because we value the safety and security of our attendees and the communities they participate in, the following will not be accepted at any event hosted, organized, or participated by the SBDC. Children under 8 years of age. Children between 8-18 years of age without parental supervision. Event attendees/participants violating these rules may be sanctioned or expelled from the event at the discretion of the event staff. The New Jersey Small Business Development Center (NJ-SBDC) network is funded in part through cooperative agreements with the US Small Business Administration and the State of New Jersey (BAC). The NJ-SBDC office in Hudson County is hosted by New Jersey City University. Sponsor funded programs are extended to the public on a nondiscriminatory basis and is not an endorsement of any products, opinions, or services. Reasonable accommodations for persons with disabilities will be made upon request. The NJ-SBDC Network is an accredited member of America's SBDC.